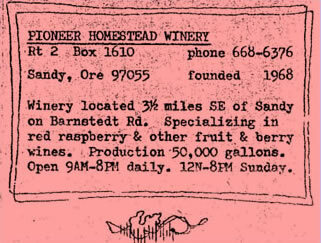 Pioneer Homestead Winery started in 1968 near the town of Sandy. The winery’s specialty was red raspberry wine. The winery was located 3 ½ miles southeast of Sandy on Barnstedt Road. Production was about 50,000 gallons a year of fruit and berry wine. It is not known when the winery ceased operating.